Did you know that fried foods are a tradition of Hanukkah? I had no idea until we were invited to a Last-night-of-Hanukkah party in our neighborhood. Due to our food allergies, my friend told me what foods would be there. After the list of foods she rattled off, she threw in "Oh, and we'll have donuts because they are tradition, too." What?!! Donuts are a religious tradition? Why am I not Jewish?!?! I quickly offered to make donuts to bring to the party. It had been a few years since I last made donuts, and I was up for the challenge again. Being me, I wanted a slightly healthy donut (trust me, they're still delicious and no one knew! 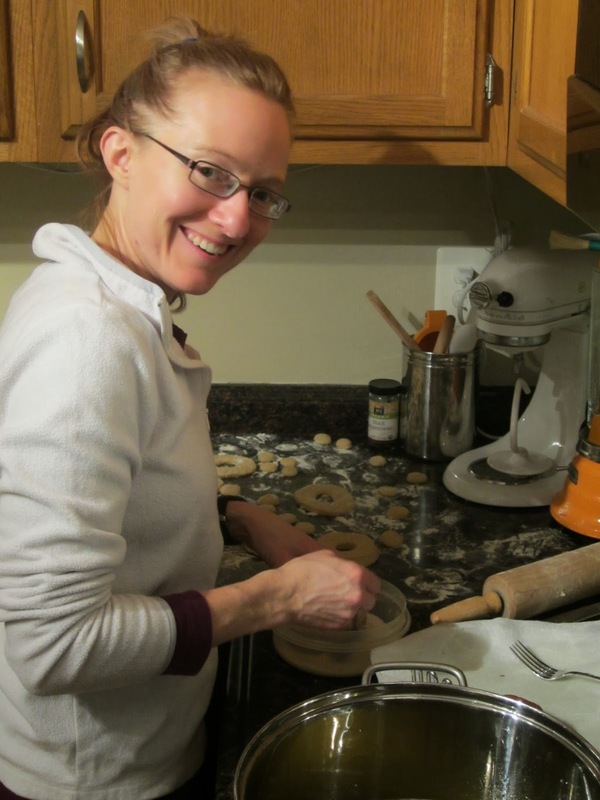 ), and I needed a recipe that was allergy-friendly. I remembered the Whole Wheat Brioche recipe from my cookbook Healthy Bread in Five Minutes a Day. Unfortunately, I can't publish the original recipes that I used since they are not mine. 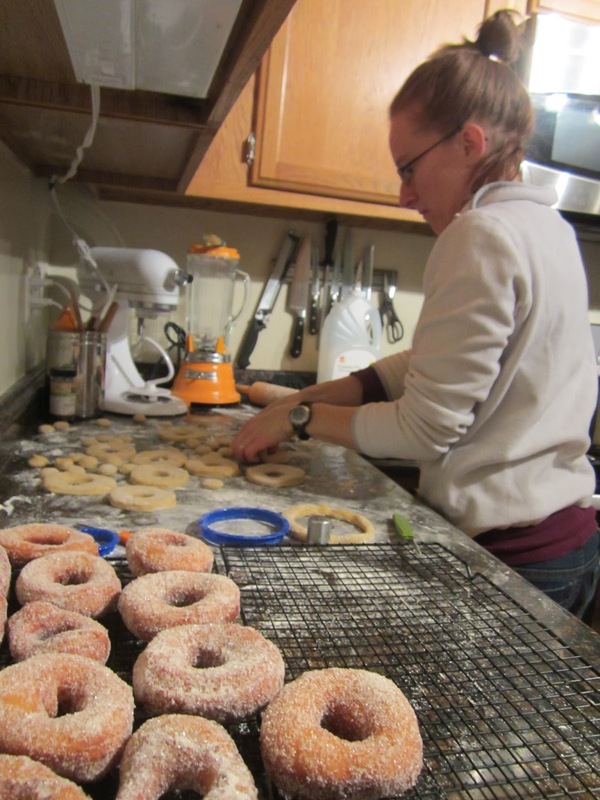 What I can do, though, is give you tips on how to get through the recipes (you have to merge two) so that it's really quite simple and delicious to make homemade donuts! Trust me, it's a fail proof recipe if you follow these tips. 1. Start with the brioche recipe on page 275. THERE IS AN ERROR IN THE RECIPE: it should call for 1/4 cups vital wheat gluten and 2.25 cups lukewarm water. Follow the super-simple directions for mixing the dough. 2. Let the batter rest on your counter, in the bowl, lightly covered, until it rises and falls (about 2 hours). 3. Put the lightly covered dough in the refrigerator for at least two hours. NOTE: you need to make this dough 4 hours before you plan to make the donuts! 4. Once your dough has rested for the total of 4 hours, turn to page 288 in the book for cooking directions. 5. Your oil will take a while to heat up but that's okay because it lets you have time to roll out your dough and cut it into circles. Do make sure you only roll your dough to 1/4 inch thickness because if it's too thin you won't have a good bite to the donut. 6. I used children's cookie cutters in the shape of circles to cut my donuts. You could also use a glass. 7. Keep your candy thermometer in the oil at all times and adjust your stove temperature to keep your oil temperature as steady as possible. 8. When you take the donut out of the oil, put in on a paper towel and then flip it to its other side. Then, I chose to just toss it in plain sugar since my daughter has allergies. Making the donuts were definitely a lot of work, but they were SO worth it! I received one of my all time favorite food compliments that night: One neighbor was late in arriving to the party so she didn't know that I had brought the donuts. She took a bite into a donut, stopped, looked at the hostess and said "These are absolutely delicious!" The hostess said, "Thanks, but Renee made them." Then, the neighbor turned to me with her mouth open and asked, "You MADE these?" I went home feeling the effort of making the donuts was completely and totally worth it!